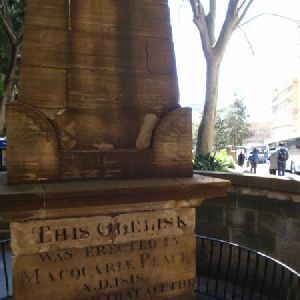 The Obelisk in Macquarie Place (Cnr of Bridge and Loftus Sts) is the original Mile Stone for 19th century roads in NSW. 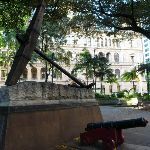 The surrounding park is the original town square built in 1810, while the Obelisk was erected by Governor Macquarie (well actually the Convicts did the heavy work) in 1818. 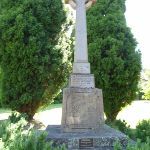 For nearly 200 years this monument stood as the zero mile/km marker for all principal roads. 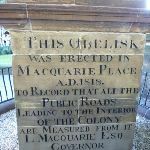 There are a number of inscriptions including distance markers and “The Obelisk was erected in Macquarie Place A.D.1818, to Record that all the Public Roads Leading to the Interior of the Colony are measured from it. 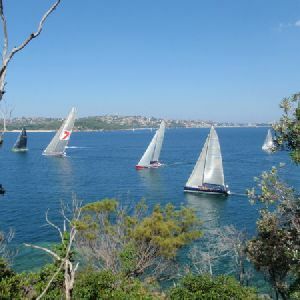 L.Macquarie Esq Governor”. 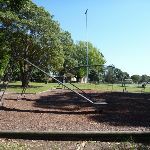 The park has a number of other historic items worth exploring. 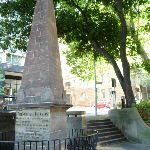 From the tall sandstone obelisk (in Macquarie Place at the intersection of Bridge and Loftus Sts, Sydney), this walk heads down along the footpath beside Loftus St, towards the view of the Harbour Bridge. 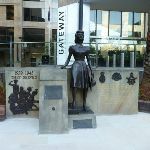 After about 80m, the footpath leads past ‘Jessie Street Gardens’, which is ‘Dedicated to the achievements of Australian women’ – definitely worth the time to read the plaques. 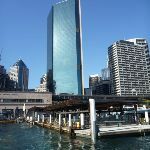 From here, the walk continues down past McDonald’s and across Alfred St to underneath the ‘Circular Quay Railway Station’ building. 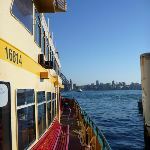 Where the harbour meets the city, Circular Quay is a transport hub joining the busy ferry wharf with the train and bus services. 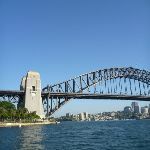 The Quay provides great views of the Harbour Bridge, Opera House and several other popular sights of Sydney. 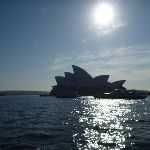 There are many small food kiosks and cafes as well as a McDonalds. 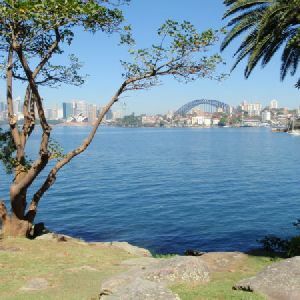 Circular Quay is the site of Australia’s first colonial settlement. 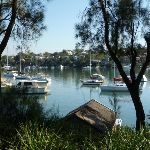 In 1794, Thomas Muir was transported to Australia and later bought a farm and built a cottage on what we now call Circular Quay. 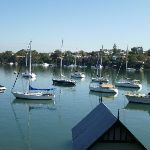 Not a great deal is known about the traditional owners, as in 1789 almost half of this indigenous population died during a smallpox epidemic. 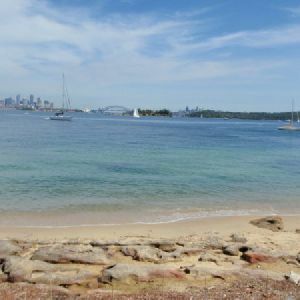 It is reported that only three Cadigal people were left by 1791. 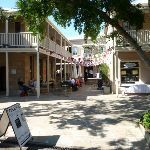 In 1879, there were some Aboriginal people living in the boat sheds (near the now Museum of Contemporary Art) when they were dispossessed of that space so it could be used for hosting an international exhibition. 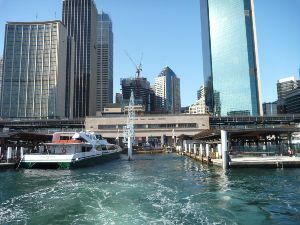 Now, Circular Quay is popular among visitors enjoying the sites, and also daily commuters. 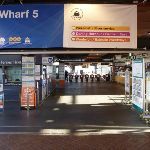 Continue straight: From Circular Quay ferry terminal, this walk heads over to Wharf 5 and catches a ferry (about $6) to Woolwich Ferry Wharf, Valentia St. A ferry leaves every 30-60 mins during the day. 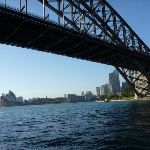 The trip is very pleasant and passes the Opera House, travels the under the Harbour Bridge, around Garden Island, near Cockatoo Island and on to Woolwich Ferry Wharf near the mouth of the Lane Cove River. 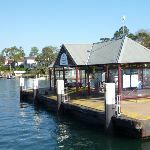 Woolwich Wharf, found at the end of Valentia Street, is a bit of a transport hub with a ferry terminal and a popular bus stop. 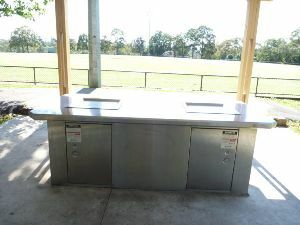 There are public toilets in the bus shelter area, a public phone box and across the road is an open grass area and kids’ playground in ‘Valentia Street Reserve’. 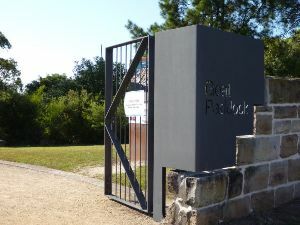 There is also a large sign highlighting the Great North Walk’s presence. 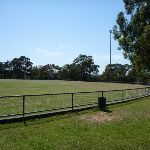 Goat Paddock is the open area north of Woolwich Dock. 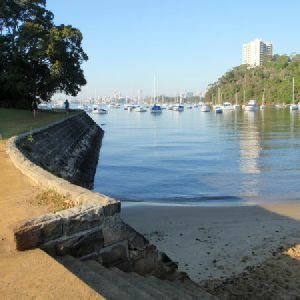 The park has a path winding down through the middle, providing access to the waters edge. 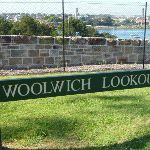 In 1835, the Clarke family received a grant of the land at the eastern end of the peninsula, what we now call Woolwich. 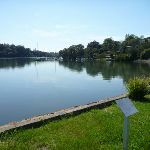 In 1898, Morts Dock and Engineering Company bought this land and commissioned the excavation of the dock. 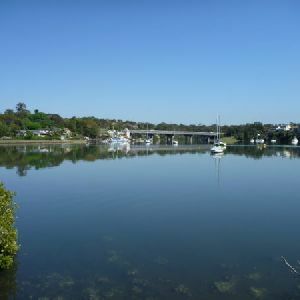 The area is well maintained and is used by many locals for their morning strolls. 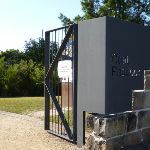 Continue straight: From the gates at the top of ‘Goat Paddock’, this walk follows the footpath uphill beside Gale St, which soon bends right. 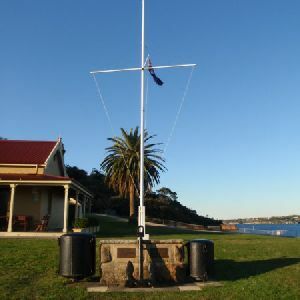 The walk passes ‘Woolwich Pier Hotel’ (on the opposite side of the road), then veers left across the grass on the signposted ‘Woolwich Lookout’ park, and soon comes to the fenced lookout platform on the left, about 80m from the lookout. 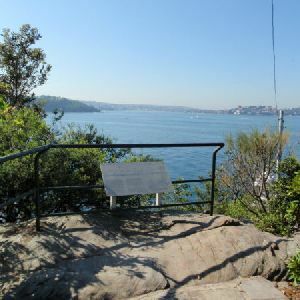 Woolwich Lookout is a fenced lookout atop of the cliffs at the western end of Woolwich Dock. 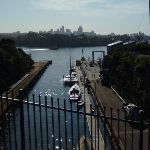 There are great views down the sandstone cutting, through the dock at the mouth of the Lane Cove River and to North Sydney. 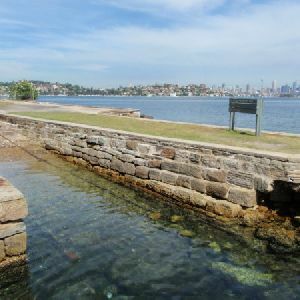 In December 1901, the W. Solomon & Sons company (commissioned by Morts Dock and Engineering Company) completed the excavation of 85,000 cubic metres of sandstone to construct this dry dock. 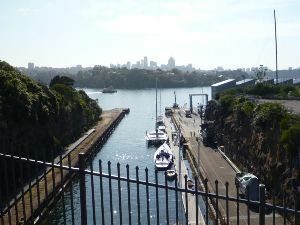 At the time, this 188 metres long, and 27 metres wide, pit was the largest dry dock in Australia. 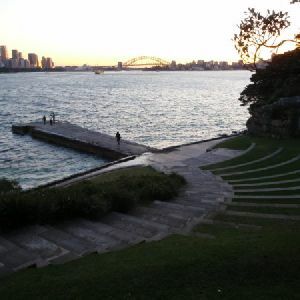 In 1963, the Army purchased the site and now it is managed by the Sydney Harbour Federation Trust. 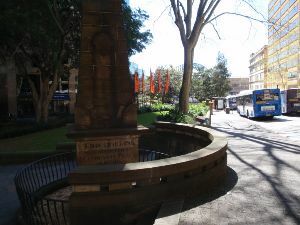 Continue straight: From the end of Alfred St, this walk follows the ‘Nelson Parade’ sign up the sandstone steps. 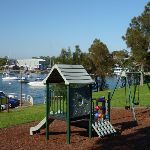 At the top of the steps, this walk turns right, following the ‘Picnic Area’ sign along the dirt track for about 80m to a three-way intersection just past a bench seat. 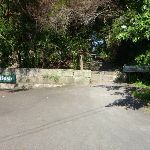 This walk veers right, following the ‘Nelson Parade’ sign up the steps, passing a ‘Kellys bush’ information sign at the top of the hill, then leaves the park through a gap in the timber fence to come to a road beside Weil Park (a large playing field). 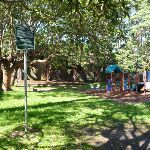 In the late 1880s, pocket of bushland between Prince George Parade and Alfred St, Woolwich was set aside to to act as a buffer zone between the Parramatta River and the Sydney Smelting Company. 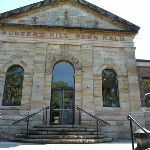 The area was named after the owner of the land and smelting company, T.H. Kelly . 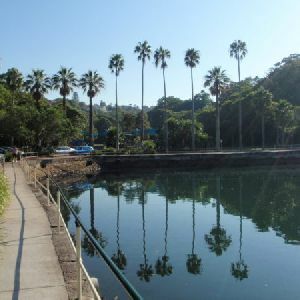 From the passion of the local people who fought to protect this area, Kelly’s Bush is now owned by the Hunters Hill Council and cared for by a team of local bush regenerators. 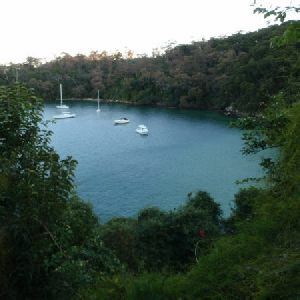 Continue straight: From the top of Kellys Bush, this walk follows the GNW arrow gently uphill along Prince George Parade (directly away from the park). 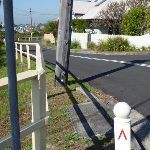 Soon after passing a set of swings (on the central reservation), this walk turns right (crossing over the other part Prince George Parade) to follow another GNW arrow post along ‘Gladstone Ave’ until coming to an intersection with ‘Woolwich Rd’. 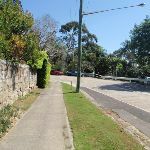 Turn left: From the intersection, this walk follows the GNW arrow west alongside Woolwich Rd for about 100m, then turns right across the road and heads to the end of Serpentine Rd. 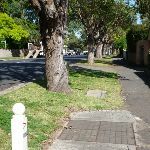 There are some GNW arrows here and a footpath on the left. 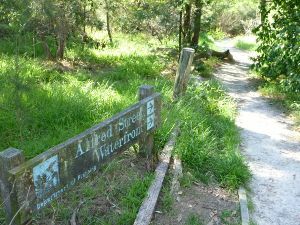 Continue straight: From the end of Serpentine Rd, this walk follows the GNW arrows down a few steps, then downhill along the footpath. 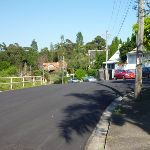 The path soon leads down to Vernon St to turn left, following the street for about 30m. 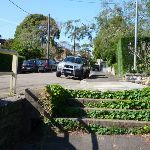 Here the walk turns right, leading down a pedestrian lane-way and steps between two house, coming to ‘Mornington Reserve’, beside Alexandra Bay on the Lane Cove River. 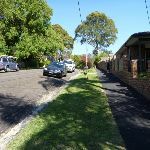 Here the walk turns left, leading up along the grassy track reserve behind some houses for about 180m to turn left at a GNW post marking another pedestrian lane-way. 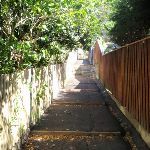 The walk heads up this lane-way then up the steps to turn right on Vernon St, coming almost immediately to an intersection with Brookes St (on your right). 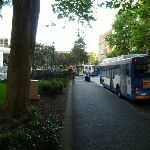 Continue straight: From the intersection, this walk heads uphill along Vernon St which soon bends left. 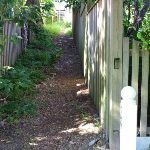 At the top of the hill, this walk turns right to follow the footpath beside Woolwich Rd for about 150m, then turns right down Futuna Lane. 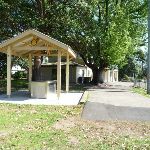 At the T-intersection, this walk turns left to follow Futuna St past the grand ‘St. 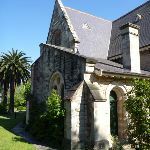 Peter Chanel Catholic Church’ building and then come to another T-intersection. 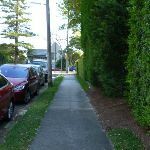 Here the walk crosses Crescent St and turns right a short distance and then left into Garrick Ave. At the end of Garrick Ave, this walk follows the GNW arrow along the zigzagging pedestrian lane way for about 170m to come to Passy Ave. 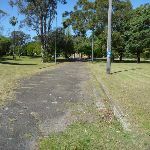 Here the walk crosses the road and turns right, following the footpath for about 150m to then turn left onto Ambrose St. After a further 100m, the walk turns right at Ferry St to pass in front of the large sandstone ‘All Saints Anglican Church’ building. 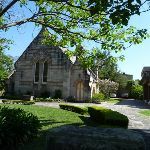 Just past this church, the walk passes a few shops to cross Alexandra St, then turns left. 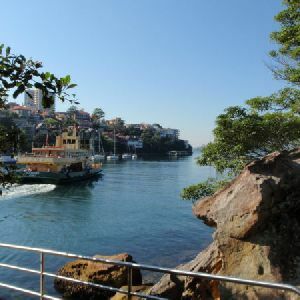 Just after crossing Ady St, this walk comes to to ‘Jaspers Restaurant’, opposite more cafes and shops. 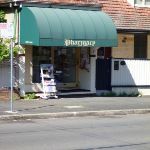 Just opposite the intersection of Alexandra and Ady Streets is a community shopping village in Hunters Hill. 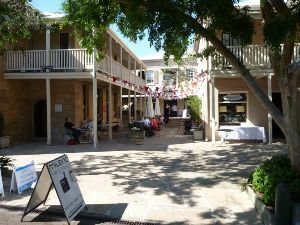 There are a few cafes and small restaurants set among a lovely series of sandstone buildings. 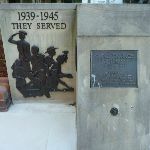 You could even get your hair cut if so desired. 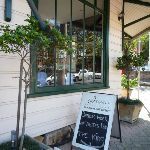 The Ricciotti Deli Cafe open 7 days 0800-1700 (weekends 0800-1500) ph: (02) 9817-7388. 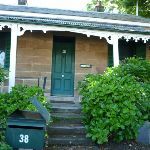 Continue straight: From in front of ‘Jaspers Restaurant’, this walk heads gently downhill along Alexandra St almost immediately passing ‘Vienna’ Cottage (an artisan’s home built in 1871). 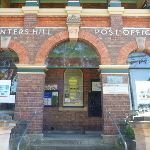 This walk continues along beside Alexandra St for about 500m, passing the post office, Masonic Centre, town hall, Congregational Church, a tiny and very old-looking pharmacy to come to a four-way intersection with Mount St (on your right), opposite a children’s playground. 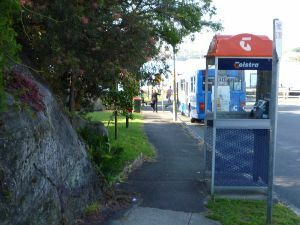 Here the walk follows the GNW post right and downhill along Mount St to come to a waterfront intersection at the end of the street. 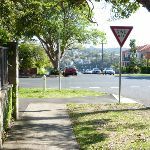 Turn left : From the northern end of Mount St, this walk follows the asphalt footpath behind Hunters Hill High School, whilst keeping the Lane Cover River to your right. 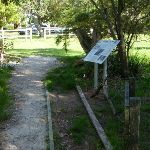 The path leads past a few information signs, then bends left at the grassy clearing to head up the side of the school. 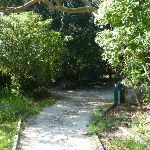 The path leads up a small set of stairs and turns right on Reiby Rd, where the walk follows the road for 100m until the road bends right. 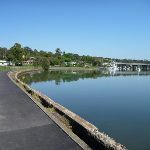 Here, the walk crosses the road to follow the GNW arrow up to the right and along the concrete footpath, which leads under under Burns Bay Rd (Fig Tree Bridge). 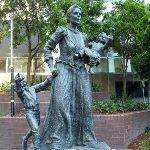 Just after passing under the bridge, the walk heads left, diagonally up through Joubert Street Reserve to Joubert St (just downhill from the intersection with Figtree Rd). 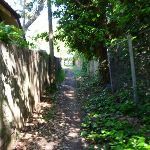 Continue straight: From Joubert Street Reserve, this walk crosses Joubert St and heads uphill to then turn right into Figtree Rd. 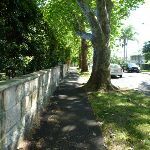 The walk leads along the footpath beside Figtree Rd for about 350m, then turns right onto Ryde Rd (there is a Coles Express service station to your left, if you want a cold drink). 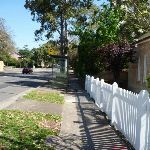 Following the footpath alongside Ryde Rd for about 500m (passing St Joseph’s College along the way), this walk comes to Boronia Ave, just beside Boronia Park. 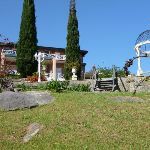 Around 8km of this walk is flat with no steps, whilst the remaining 2.4km has gentle hills with occasional steps. 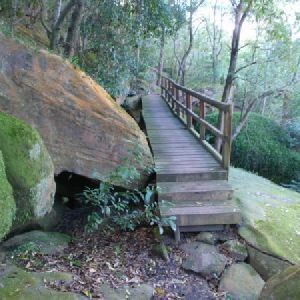 8km of this walk follows a smooth and hardened path and another 2.5km follows a clear and well formed track or trail. 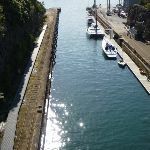 The remaining (420m) follows a formed track, with some branches and other obstacles. 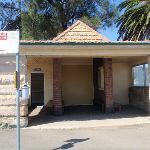 Around 10km of this walk is clearly signposted, whilst the remaining 420m has directional signs at most intersection. 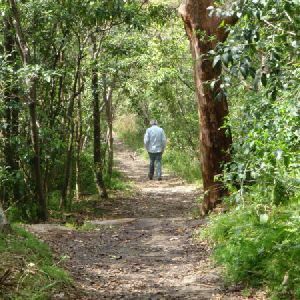 A list of walks that share part of the track with the Sydney to Boronia Park walk. 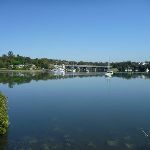 A list of walks that start near the Sydney to Boronia Park walk. 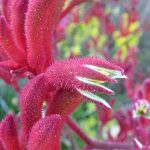 http://new.wildwalks.com/wildwalks_custom/includes/walk_fire_danger.php?walkid=nsw-huntershilllga-stbp Each park may have its own fire ban, this rating is only valid for today and is based on information from the RFS Please check the RFS Website for more information.